Whether we look to lead poisoning in Flint, Michigan, or off-the-charts air pollution in Beijing, public awareness around the role of the environment in health is on the rise. To keep pace with these and other outsized challenges, the field of environmental health sciences is evolving, led by scientists like Andrea Baccarelli, the incoming chair of Environmental Health Sciences at the Mailman School. Over the last decade, Baccarelli helped develop powerful new tools in environmental epigenetics, not only to document the health risks of a variety of synthetic toxins, but also as an avenue to prevention, and potentially even targeted therapies. 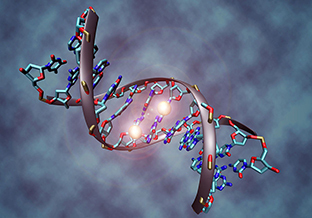 For those needing a primer, epigenetics concerns itself not with genetic changes to the DNA itself, but to changes that affect the way the body interprets the code. Baccarelli uses the analogy of a musical score, which, like DNA, is a kind of code that is open to interpretation. A single bar of music can be performed in many different ways, resulting in something tuneful or cacophonous. Epigenetic changes can be thought of as the marks a musician adds to the score ahead of a performance that do not change the score itself, but serve to help the performer to color the music in one way or another. Extending the metaphor, these marks may be made in pencil or pen. In the same way, epigenetic changes may be transitory or long lasting, potentially shaping human health over a lifetime. Enticingly, the impermanence of some of these changes suggests the possibility of undoing the damage. Trained as a clinical endocrinologist, Baccarelli became interested in the way chemicals interact with genes to disrupt the endocrine system. Switching from genetics to epigenetics, he was among the first to show that pollutants reprogram the human epigenome through a process called DNA methylation, in which a molecular structure known as a methyl group attaches itself to DNA, silencing some genes and activating others. Since 2010, he has published more than 170 papers, many highly cited, exploring all manner of environmental exposures: air pollution, metals, chemicals like bisphenol A, and psychosocial stress. One of these studies was among only two considered by the Environmental Protection Agency when it lowered the standard for the safe level of dioxin emissions based on research showing exposure to the chemical in utero affected thyroid function in children. Over the course of his career, Baccarelli has expanded the vocabulary of epigenetics, showing how environmental damage inscribes itself in the body. In a study of foundry workers exposed to metal-rich air particles, he measured how long each worker was exposed through changes in a family of nuclear proteins called histones that, like methyl groups, can activate certain genes. The same study identified yet another epigenetic marker—inflammation-related microRNAs, a type of non-coding RNA that did the opposite, quieting genes. Epigenetics has become an indispensible tool in environmental health research that can tell us things we cannot learn in any other way. For example, in one ongoing study, Baccarelli is looking for markers of obesity in umbilical cord blood. “We want to know whether we can find out very early in [a baby’s] life—the day they are born—if they will become overweight as they grow up,” he says. As it stands, clinicians must wait a year or two before an abnormal weight trajectory becomes apparent. And by then, he says, dietary interventions are often ineffective. In an upcoming study of older adults, he hopes to identify an epigenetic marker for cognitive function. The project will employ mitochondriomics, which measures changes to DNA in mitochondria, the cell’s power plant, rather than the usual nuclear DNA. Baccarelli says he is excited by “the Mailman School’s critical mass of investigators working on aging,” and looks forward to collaborating on new research into older populations susceptible to environmental toxins and climate changes. Meanwhile, Baccarelli is exploring avenues for prevention and treatment. One recently completed National Institutes of Health-funded study is exploring whether a vitamin supplement can make a difference for people whose epigenomes have been changed by air pollution. “Potentially with these nutritional supplements, we can reverse those changes, or at least prevent them before they happen,” he says. Another target is a type of extracellular RNA that travels through the body in tiny capsules known as vesicles and serves as a kind of communication system between organs and tissue. Every time we inhale air pollution, these RNA send a pro-inflammatory signal that appears to inflict damage on multiple organs. “Potentially we could create signals that go in the opposite direction,” he says. Not surprisingly, Baccarelli is eager to be a part of Columbia University’s Precision Medicine Initiative. At the Harvard T.H. Chan School of Public Health, where he currently serves as associate professor of Environmental Epidemiology, Baccarelli designed and taught the first class worldwide on environmental epigenetics. When he joins the Mailman School in June as chair of Environmental Health Sciences, teaching epigenetics will continue to be a priority.